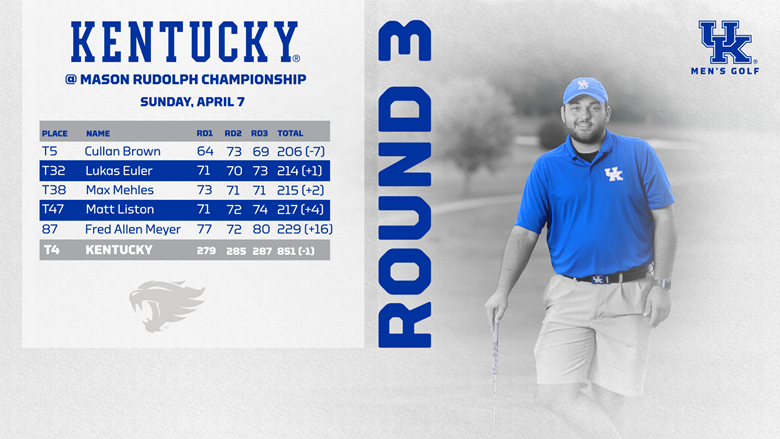 FRANKLIN, Tenn. – The Kentucky men’s golf team finished in a tie for fourth following a rain-soaked Sunday round at the Mason Rudolph Championship that featured three stoppages in play before the tournament concluded. Freshman Cullan Brown’s breakout weekend continued during Sunday’s final round with his second sub-par score of the week to finish in a tie for fifth on the individual leaderboard and lead the way for the Wildcats. Kentucky’s fourth-place finish is the best of the season, and its 851 team score was also a season best, bettering its previous mark by seven strokes. It also ties for the 11th best team tournament score under head coach Brian Craig. The team’s opening round on Friday was a large reason for this weekend’s success, as 279 was its best team round of the season. 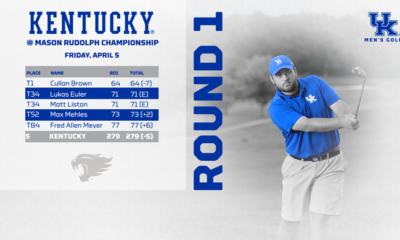 Brown’s stellar weekend started on Friday when he shot an opening round of 64 which tied for the lowest individual round in the Craig era at Kentucky, equaling Jordan Blann’s record from 2009. Brown shot a 69 on Sunday, meaning Brown broke his previous career-best of 70 twice in one weekend. Brown shot a 2-under 69 during Sunday’s shotgun start. He opened play with a bogey at the par-four fifth, but got back to even with a birdie at the par-four eighth. He then played 3-under par over his final 17 holes for the first top-10 finish of his career. Senior Max Mehles was also spectacular on Sunday with an even-par 71. His round was highlighted by the birdie on his final hole that aided the team score. He tied for 38th overall in the tournament with a 2-over par score. It was the 10th par-or-better round of the season for Mehles. Classmate Lukas Euler tied for 32nd with a combined 1-over par effort. He charted a 73 on the final day of play. Junior Matt Liston took home a share of 47th with a 74 on Sunday. Senior Fred Allen Meyer placed 87th, while classmate Fadhli Soetarso, playing as an individual, tied for 75th. Soetarso had his best round of the tournament with a 73 on Sunday. Fourth-ranked and the host Commodores were 17 strokes better than the rest of the field for first-place honors. No. 20 Liberty was second and 25th-ranked Tennessee rounded out the top three. Kentucky tied for fourth at 1-under par with Middle Tennessee State, Coastal Carolina and Western Kentucky. Kentucky will return to action on April 15 when the Wildcats travel to Birmingham, Alabama, to compete in the two-day Shoal Creek Invitational.